This Thomas & Friends Minis Motorized Stunt Set introduces motorized play for even more fun and excitement! It all starts when you send the included Thomas and James Minis up the steep vertical lift. They climb automatically as the motorized playset lifts them up for an action-packed multi-track adventure. When they reach the top of the set, turn the switch to choose your track. 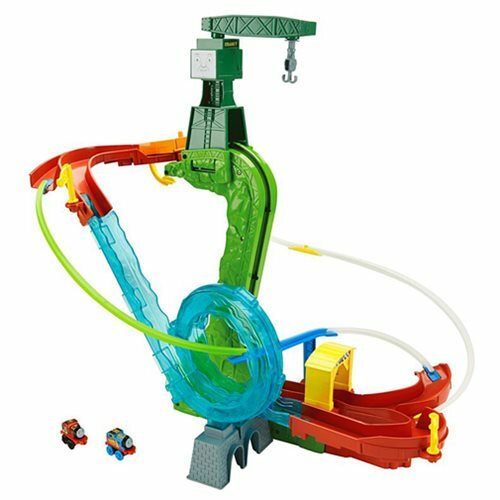 The first track is the water track, sending your Minis down the waterfall and right into a 360-degree loop! Next up is a freefall drop track headed toward a broken piece of track. Swivel Cranky the Crane to swoop in and rescue Thomas and James. As your engines pick up speed, they jump over the gap and land on the track ahead in thrilling daredevil fashion! The final track seems headed for nowhere, but have no fear. Your Minis will simply roll off the edge, defying gravity and rolling upside down along the inverted sky track! The Thomas & Friends Minis Motorized Stunt Set Playset includes Thomas and James Minis engines and can be used with other Minis engines (sold separately). Ages 3 and up.